Lions new director of rugby Simon Moyle. Peterborough Lions have appointed a director of rugby with a role of taking the club higher in the National League. Simon Moyle has landed the job and will officially take up the new position at the end of the season. Borough Under 16s celebrate their East Midlands Cup success. But he’s keen to get going and has already been involved in meetings geared towards hiring players from the Fijian Under 20 national side. “He can’t wait to get started. He’s got some great ideas and we’re looking forward to a brighter future,” said chairman Andy Moore. “We’ve been in National League Division Three for two seasons and done well. We’re now ready to take the next step up the ladder to Division Two. Simon’s on board to help us achieve that and to make sure we stay at that level. ”Initially he’ll be drawing up a five-year plan for the future and that will include forging links with other local clubs to enhance rugby as a whole in the Peterborough area. “At the moment we are a single-team club. Simon will be working on starting a development team for us. Moyle played rugby for Cornish Pirates, Camborne and Cornwall and was a coach at Borough with Andrew Phillips when he first moved to the area. He also played cricket for Cornwall. Moyle, general manager at Augean PLC, said: “I am really excited by the challenge ahead. “Having spoken at length with both Andy (Moore) and Darren (Fox), it is refreshing to be working with two committed and passionate rugby people and I can assure everyone connected with the Lions that we are all perfectly aligned in our thinking and how we want to see the club move forward next season. There was more success for high-flying Oundle and Borough Under 16s at the weekend. Midlands East Division Three champions Oundle advanced to the Midlands final of the RFU Senior Vase by smashing Southam 62-13 with Robb Shingles grabbing four of their tries. 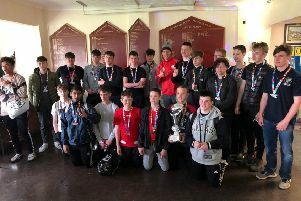 Borough Under 16s, already East Midlands Premier Division champions and Cambs County Cup winners, added the East Midlands Cup to their impressive haul of trophies by beating Northampton Old Scouts 24-3 in the final. Thorney are through to the Hunts & Peterborough County Cup final where they’ll meet Huntingdon seconds. On Saturday they ended Borough seconds’ 14-match winning run by taking the honours 20-15 in a tight semi-final. Chris Phillips, Sean Leedell and Ed Johnson scored their tries.